Mexicali (English: /ˌmɛksɪˈkæli/; Spanish: [mexiˈkali] ( listen)) is the capital city of the Mexican state of Baja California and seat of the Municipality of Mexicali. 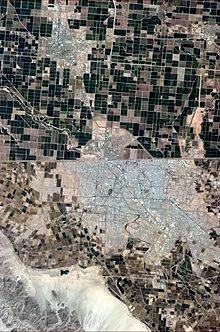 The City of Mexicali has a population of 689,775, according to the 2010 census, while the population of the entire metropolitan area reaches 996,826; making the city and metropolitan area the second most populous in Baja California. Mexicali's economy has been historically based on agricultural products, and they remain a large sector of the economy. However, its economy has gradually gone from being agricultural to include industry, mainly maquiladoras—duty-free factories in which parts from the United States are imported, assembled, and then returned to the United States as finished products. International companies including Honeywell, GKN Aerospace, Kellogg's, Gulfstream, UTC Aerospace Systems, SunPower, Rockwell Collins, LG Electronics, National Oilwell Varco, Mitsubishi, Autolite, Nestlé, Coca-Cola, Robert Bosch, and Goodrich Corporation have built maquiladora plants in the city. The Spaniards arrived in the area after crossing the Sonoran Desert's "Camino del Diablo" or Devil's Road. This led to the evangelization of the area by Catholic missionaries and also to the reduction of native populations in the region. Nowadays, indigenous Cocopah people still inhabit a small government-protected corner of the Colorado River delta near the junction of the Hardy and the Colorado. The Cocopah mostly work on agricultural ejidos or fishing. The early European presence in this area was limited to Anza's and subsequent Spanish expeditions across the Colorado Desert and subsequent travelers on the Sonora Road opened by them. Also the presence of the Jesuits who attempted to establish a mission in what is now Fort Yuma. They left after a revolt by the Yuma in 1781. After this, the Spanish had little to do with the northeastern corner of the Baja California Peninsula, perceiving it as an untamable, flood-prone desert delta. Later in the 1820s, the Mexican authorities reopened the Sonoran Road and restored peaceful relations with the Yuma People. The Sonoran Road provided a route for American fur trappers, and later American troops of Kearny and Cooke passing through the area during the Mexican–American War. The annexation of most of Alta California soon was followed by the California Gold Rush that saw a flood of gold seekers from Mexico on the Sonora Road, especially from Sonora, and from the United States via the Southern Emigrant Trail. Herds of cattle and sheep were driven into California across this desert trail also. This route became a U. S. Mail and stagecoach route in 1857 when the San Antonio-San Diego Mail Line and in 1858 Butterfield Overland Mail route passed along the Alamo and New Rivers and established stations there including its New River Station in the vicinity of a Laguna along the New River in what is now Colonia Hidalgo, Mexicali in 1858. This mail route remained in use until 1877 when the Southern Pacific Railroad came to Yuma making it obsolete. In the mid-19th century, a geologist working for the Southern Pacific Railroad came to the delta area, discovering what the native Yumans had known for centuries: that the thick river sediment deposits made the area prime farming land. These sediments extended far to the west of the river itself, accumulating in a shallow basin below the Sierra de Cucapá. However, from this time period until the 1880s, the area was almost completely unpopulated, mostly due to its harsh climate. In 1888, the federal government granted a large part of northern Baja state, including Mexicali, to Guillermo Andrade, with the purpose of colonizing the area on the recently created border with the United States. However, around 1900, the only area with any real population, aside from the Cocopah, were concentrated in Los Algodones, to the east of Mexicali. In 1900, the U.S.-based California Development Company received permission from the government of Díaz to cut a canal through the delta's Arroyo Alamo, to link the dry basin with the Colorado River. To attract farmers to the area, the developers named it the "Imperial Valley". In 1903, the first 500 farmers arrived; by late 1904, 405 km² (100,000 acres) of valley were irrigated, with 10,000 people settled on the land harvesting cotton, fruits, and vegetables. The concentration of small housing units that straddled the border was called Calexico on the U.S. side and Mexicali on the Mexican side. Led by Los Angeles Times publisher Harry Chandler, one company controlled 800,000 hectares of land in northern Baja California by 1905, and began to build the irrigation system for the Valley. However, instead of using Mexican labor to dig the ditches, Chandler brought in thousands of Chinese laborers. Mexicali became culturally Chinese influenced. The Mexican side was named Mexicali (a portmanteau composed of "Mexico" and "California") by Coronel Agustín Sanguinéz. 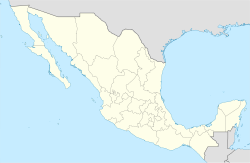 Initially the area belonged to the municipality of Ensenada. The town of Mexicali was officially created on 14 March 1903 when Manuel Vizcarra was named as the town's first authority and Assistant Judge (juez auxiliar). On January 29, 1911, Mexicali was briefly "liberated" by the Liberal Party of Mexico during the Mexican Revolution. Mayor Baltazar Aviléz declared the municipality of Mexicali on November 4, 1914 and called for elections to creation of the first ayuntamiento or Municipality, which was then headed by Francisco L. Montejano. In the 20th century, the Colorado Riverland Company, a U.S.-based company, was dedicated to renting Mexican land to farmers; however, these farmers were almost always foreigners, such as Chinese, East Indians and Japanese. The Mexicans were employed only as seasonal laborers. This situation led to the agrarian conflict known as the "Asalto a las Tierras [es]" (Assault on the Lands) in 1937. in which Mexican land was taken by Mexicans. Agricultural production continued to increase during the 20th century. Cotton became the most important crop and it help develop the textile industry. In the early 1950s, the Mexicali Valley became the biggest cotton-producing zone in the country and in the 1960s, production reached more than half a million parcels a year. Currently, the Valley still is one of Mexico's most productive agricultural regions, mostly producing wheat, cotton and vegetables. The city of Mexicali is one of Mexico's most important exporter of asparagus, broccoli, carrots, green onions, lettuce, peas, peppers, radishes and tomatoes to the world. The government of the municipality was reorganized when the Baja California territory became the 29th state in 1953. Today Mexicali is an important center for maquiladora (assembly plant) production in the automotive, aerospace, telecommunications, metallurgical, and health items as well as manufacturing and exporting products to various countries. The 2010 Baja California earthquake occurred on Easter Sunday about 60 km south-southeast of Mexicali. This very large magnitude 7.2 earthquake occurred at 15:40:40 local time (UTC−8) according to the U.S. Geological Survey. With a maximum Mercalli intensity of VII (Very strong), it was felt in northern Baja California near the United States–Mexico border, and was also felt in western cities such as Tijuana, San Diego, Los Angeles and parts of Arizona. The Mexicali Valley is one of the largest and most fertile valleys in Mexico. Over fifty different crops are grown in the valley, which is similar in production to the Imperial Valley. National and international industries have invested in Mexicali and surrounding cities to take advantage of its tax-free status given to industry. The Mexicali Valley is a primary source of water for the region, which is the largest irrigation district in Mexico. 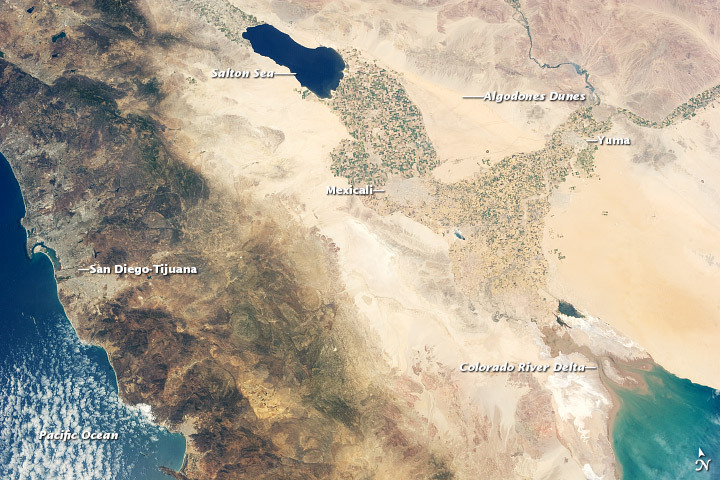 Despite its arid desert location, Mexicali is watered through a system of aquifers in the valley. Under a 1944 Water Treaty, the city is "...guaranteed [an] annual quantity of 1,500,000 acre feet (1.9 km3) [of water] to be delivered..." from the Colorado River. However, a proposed concrete lining in the United States on the All-American Canal would cut off billions of leaked gallons of water, which is used to irrigate onions, alfalfa, asparagus, squash and other crops in Mexicali. The nearby Cerro Prieto volcano is adjacent to the Cerro Prieto Geothermal Power Station. which creates high volumes of pollutants, among them, mercury. As of 2014, the government are creating a zone of exclusion, due to the alarming amount of pollutants and contamination that has permeated throughout miles around the geothermal plant of Cerro Prieto. Because of its low annual precipitation, Mexicali has an arid climate (BWh), featuring long, extremely hot summers and mild to warm winters. Under the criteria for the Köppen climate classification, Mexicali maintains desert weather temperatures every year. On December 12, 1932, the city experienced snowfall. Rainfall usually occurs in the winter months of December, January and February. Although Summer is extremely dry in Mexicali, one of every two days there is an end moisture content. In 2008, during the months of July and August there were several heavy thunderstorms that let down large amounts of rain and hail. Summer rainfall in the city is infrequent. During winter time, Mexicali is affected by the snow storms that pass by the town of La Rumorosa located in the Sierra de Juárez, about 45 minutes west of the city, causing a decrement in temperature that lasts from two days to one week. In its beginnings Mexicali was an important center for cotton production for export, until synthetic fabrics reduced the worldwide demand for the fiber. Currently, horticulture is the most successful agricultural activity with scallion (green onion), and asparagus being among the most important crops. Cotton and wheat are still grown, but low government price guarantees and subsidies make wheat farmer protests an annual event. There is an annual agri-business fair, which if unfunded by public money given to by the government, it would have been dead a decade ago, named AGROBAJA,Agrobaja in March of every year, drawing people by the thousands, from all over Mexico and before the crisis, from the United States. The current prospects for economic growth in Mexicali rely on in-bond and assembly plants (maquiladoras), which come due to low wages and loose worker right laws, include companies like, Selther, Daewoo Electronics, Mitsubishi, Honeywell, Paccar, Vitro, Skyworks Solutions, CareFusion, Bosch, Price Pfister, Gulfstream, United Technologies Corporation, Kenworth, Kwikset and Rockwell Collins. Mexicali is also home to many food processing plants such as Nestlé, Jumex, Bimbo, Coca-Cola, Kellogg's, and Sabritas. Silicon Border is an empty 40-square-kilometre (9,900-acre) development supposedly tailored to the specific needs of high-technology manufacturing and is situated in the outskirts of Mexicali, along the western border of the U.S. and Mexico. The aim of the empty manufacturing park, which began in 2004, was to transform Mexicali into the world's next semiconductor manufacturing center, if the world economy was fine. The Mexican federal and Baja California state governments have given away $2 million of public money to private hands, without a referendum for the design of the project and the laying of a few streets and lamp posts that can be seen on the premises as the only work done. Neither authorities nor the private frontmen of the project have given the public any account on what the public money was spent on. Former president Vicente Fox offered 10 years of a tax rate as low as 3% to foreign owned factories. The premises sit empty as of April 2019. Mexicali also relies on tourism as a medium to generate revenue, and visitors cross by foot or by car from Calexico, United States, every day. Tourists are mainly attracted to local taco stands, restaurants, pharmacies, bars and dance clubs. Near the border, in walking distance, there are many shops and stalls selling Mexican curios and souvenirs. Arizona and Nevada residents look for medical and dental services in Mexicali, since they tend to be less expensive than in the United States. Pharmacies sell some drugs without a prescription and at much lower cost than in the US, but some medications still require a doctor's prescription, although several accessible doctor offices are located near the border as well. Mexico's drinking age is 18 years old (vs. 21 in the United States) which makes it a common weekend destination for many high school and college students from Southern California. Mexicali hosts Baja Prog, one of the world's most important events in progressive rock. Since 1997, Baja Prog has been in the eyes of the world for being an event gathering the best bands of the progressive rock scene. Mexicali hosts four main shopping malls, the most visited being Plaza La Cachanilla, located a mile away from the US border. The mall hosts a variety of shops, which sell a wide array of items, ranging from cheap Mexican curios to expensive imports. The Plaza La Cachanilla also represents a common place for people to socialize, especially during Summer days when the weather reaches high temperatures, many families come and spend the day inside the air-conditioned mall. For recreation, Mexicali has bath halls, bowling alleys, traditional cantinas, car clubs, strip clubs, movie theaters, museums, a zoo, a convention center, supermarkets, and fast food restaurants for every choice of food. Galerias del Valle, holds a WalMart Supercenter, a 12-screen movie theater Cinepolis, two casinos, and a food court, plus a large array of stores that sell many items needed for daily living. It is located on Boulevard Lazaro Cardenas at Calle 11. The municipality of Mexicali is divided into the city main and 14 Administrative Districts, which are mainly located in the outskirts of the city and the largest populations in the Mexicali Valley. These Distrital offices offer municipal services such as Urban Planning, Vital Statistics, Street-Vending Inspection, Compliance, Public Works and Community Development and are, each, supervised by a Municipal Delegate. Civic Center – In this sub-area are located the main federal, state and municipal buildings. Not far from the Civic Center is the New River, where there are other prominent buildings and premises like the CEART (State Center for the Arts) and the Mexicali Zoo. The city claimed to have the largest per capita concentration of residents of Chinese origin in Mexico, around 5,000 until 2012 when the Tijuana La Mesa District surpassed that number at 15,000 Chinese immigrants. The Chinese immigrants came to the area as laborers for the Colorado River Land Company, an American enterprise which designed and built an extensive irrigation system in the Valley of Mexicali. Some immigrants came from the United States, often fleeing anti-Chinese policies there, while others sailed directly from China. Thousands of Chinese were lured to the area by the promise of high wages, but that never materialized. Since 2000, new migrants from China to Mexicali come from many of the same areas as before 1960, with perhaps 90% from Guangdong or Hong Kong. As of 2010, the city of Mexicali had a population of 689,775. The city itself had a 2005 census population of 653,046, whereas the municipality's population was 895,962. It is the 13th largest municipality in Mexico as of the Census 2005 with population estimates exceeding one million alone. The population is constantly growing due to the number of maquiladoras in the area, lack of urban planning, and migrational aspects, like seasonal labor and the constant in-and-out flow of immigrants to the U.S. or into Mexico. A study by Instituto Mexicano de la Competitividad has listed Mexicali as Mexico's most polluted air of large cities, with a PM10 rating of 137 for the year 2010. It is thought that the reason is lack of pavement (dust) and lack of wind, especially in summer. No information for PM5 or PM2.5 was given. Monterrey, Cuernavaca, and Tijuana rounded up the highest PM10 list in the study. Some public universities in the city include Autonomous University of Baja California, Campus Mexicali, Universidad Politécnica de Baja California and the Mexicali Institute of Technology. Private universities include Centro de Enseñanza Técnica y Superior, University of the Valley of Mexico and Xochicalco University. The residents of Mexicali (Mexicalenses) call themselves "Cachanillas" (due to a local plant, the cachanilla, used by the Cucapah tribe to build shacks) and are from culturally diverse backgrounds, and it is among the most ethnically diverse cities in Mexico, with people from various Native American, European, African, East Asian, and Middle Eastern origins. There is a very popular song called "Puro Cachanilla" also known as "El Cachanilla" that identifies people from Mexicali. Teatro de Casa de Cultura de Mexicali. Idem. Teatro Universitario de Mexicali, it is mainly used for UABC ceremonies and occasionally for plays. Teatro al Aire Libre de Rectoría which hasn't been used in the last 30 years. Teatro del Seguro Social that was inaugurated in the 1970s. Teatro al aire libre del Centro de Enseñanza Técnica y Superior CETYS unveiled in September 2006. Teatro del Centro de Enseñanza Técnica y Superior CETYS. Mexicali also has the Baja Prog festival, a series of progressive rock concerts that take place during four consecutive days in springtime. It is hosted by CAST, a progressive rock band from Mexicali. Mexicali has many sites where people from all over the country visit, as well as visitors from United States and Canada, such as the bullfighting arena, Plaza Calafia, where one or two bullfights are organized along the year. Mexicali also has a professional 18-hole golf course "Club Campestre" where both national and international championships have taken place. Mexicali's basketball teams are the Bomberos de Mexicali of the CIBACOPA Pacific Circuit and Soles de Mexicali of the Liga Nacional de Baloncesto Profesional (LNBP) of Mexico. Soles lifted the National Trophy as the 2006/2007, 2014/2015, and 2017/2018 LNBP Champions. Their stadium is the "Auditorio del Estado" located in the "Ciudad Deportiva de Mexicali". The Bomberos de Mexicali were founded in 2010 and participate in the Pacific Coast Basketball Circuit, CIBACOPA. The team demonstrated strong results in the first leg of its inaugural season, yet was negatively affected by the April 4th earthquake of the Mexicali region, seeing its second leg play out as a road team in Tijuana's Municipal Auditorium. Due to the earthquake and its aftershocks, the Civil Protection Ministry of Mexicali ceased all massive events within closed structures. The Bomberos reached an agreement with the Municipal Government to renovate the hardwood of the Mexicali Gymnasium and call the Silver Colossus their home. Mexicali was also home to the now defunct franchise Calor de Mexicali (Mexicali Heat), which participated in the 2007 edition of the Pacific Coast Basketball Circuit. They played their home games at the "Gimnasio de Mexicali" located on "Avenida Reforma". Mexicali was also home to a 2006 American Basketball Association franchise, the Centinelas de Mexicali (The Sentinels). "Ciudad Deportiva" houses a football stadium where Cachanillas de Mexicali, a Mexican Third Division team plays. The home of the Pioneros del Valle, also a Mexican third division football team, is located in the Mexicali Valley. In addition, "Ciudad Deportiva" is the location of "Estadio B'Air" where the professional baseball team "Águilas de Mexicali" plays every season. The Águilas de Mexicali is a Mexican baseball team playing for the Mexican Pacific League in Mexicali, Baja California. The team was founded on October 14, 1976. They have won the championship four times, 1985–1986 (coach Benjamin Reyes), in 1988–1989 (coach Dave Machemer), in 1998–1999 (coach Francisco Estrada), and in 2016–2017 (coach Roberto “Chapo” Vizcarra). The team also won the 1986 Caribbean Series, played in Venezuela. The "Águilas de Mexicali" were formed in 1976 and have been a member of the Mexican Pacific League since. They are located in the border city of Mexicali, Baja California and have won four LMP pennants. Their brightest moment came when they won the 1986 Caribbean Series, only becoming the second Mexican team to take the title. Mexicali was the host for the Caribbean Series in 2009, and the qualification for the 2017 world baseball classic in March 2016. The Centinelas de Mexicali is a professional Mexican baseball team which plays in the North Sonora League, the main supporting league of the "LMP". Mexicali young baseball players, through the Little League program, have played three times in the Little League World Series in Williamsport, Pennsylvania; first in 1985 Félix Arce Little League representing the United States West, and then in 2005 and 2007 the Seguro Social Little League, represented Mexicali. The team plays in the newly built convention center, while local businessmen negotiate a deal for an American football team with the af2 under ownership of the Arena Football League in 2008. The owners announced they made a new team, the Mexicali Borregos Salvajes but has not officially joined af2 but could play in the Mexican Pro American Football League in games against teams from across Mexico. Rail tracks on Avenida Lopez Mateos leading north to the border crossing. Mexicali is located at a Junction of major interstates and federal highways. These include Interstate 8, leading from San Diego to the Arizona Sun Corridor where the cities of Phoenix and Tucson dominate, Federal Highway 2, which leads east to San Luis Río Colorado and west to Tijuana, and Federal Highway 5 connecting San Felipe with Mexicali. Other roads lead southwest to Ensenada or north to the Imperial Valley. The road system in the city of Mexicali and its conurbation is very complex. Over the urban area long boulevards are traversed from one end of which most are 6 lanes with a median of 2 lanes. The backbone of the city is the Lazaro Cardenas Boulevard extending from east to west. This boulevard is 24.5 km long and consists of 6 lanes (3 each direction), a shoulder in each direction, and ridges of 3 lanes creating a wingspan of 50 meters. In certain sections the boulevard is made of 8 to 10 lanes. Other important boulevards include: Adolfo Lopez Mateos, Benito Juárez, Anáhuac, Justo Sierra, Venustiano Carranza, Manuel Gómez Morin, Francisco L. Montejano, Cetys, Héctor Terán Terán, Independencia and Heroico Colegio Militar, among others. There are two corridors within the city: New River Ecological Corridor, which is guided in the ancient New River bed, and the Palaco Industrial Corridor, this crosses the southern Industrial zone of Mexicali. There is also the beltway, located in the east of the city, connecting the Lazaro Cardenas Blvd. with Islas Agrarias Blvd. and the road to Colonia Abasolo, and this in turn with the Airport Road. Within the urban area there are vehicular bridges, like the Lázaro Cárdenas-Benito Juárez Blvds. underpass, Héctor Terán Terán-San Felipe Hwy underpass, Adolfo López Mateos-Independencia Bridge, and Lázaro Cárdenas-Adolfo Lopez Mateos Distributor. The latter has a 15-m high bridge which makes it the highest in northwestern Mexico. It was also designed with first-world seismic technology, and would withstand earthquakes of similar intensity as the one that occurred on April 4, 2010. On 6 January 2011 at a press conference, the city of Mexicali, led by Francisco José Pérez-Tejada Padilla, along with the state governor José Guadalupe Osuna Millán, unveiled the modernized Palaco Industrial Corridor. This project would have been the largest and most expensive in the history of road infrastructure in Mexicali with an initial investment of 285 million pesos and 546 million more for the installation of the Express Line 1 (Fast Transportation bus line), with a total investment of 831 million pesos. The new Palaco Industrial Corridor began constructions in March 2011, with 6 lanes and berms at the edges that included two additional lanes to service the BRT. Its opening was planned for Wednesday, March 14, 2012. However, the project sits unable to be used since the Chief Architect for the project, who is the brother of the City Mayor, mis-measured the lanes on which the buses were to travel on, which ended up being more narrow than needed, rendering the whole project useless. Nobody knows where the tonnes of unused cement lay and what was done with it and the money was never spent. Modern service unit with A/C: 13.00 pesos, although they change the amount in units which have no Air Conditioning on. The city is linked to other Mexican cities by Mexicali International Airport, which serves the city and the surrounding towns. The proposed canal linking the Gulf of California with Mexicali, by way of Laguna Salada, would provide sea transportation to and from the Gulf from other important west coast cities and regional inland centers such as San Diego, Ensenada, and Phoenix. ^ Slightly adapted to Wikipedia usage after: J. C. Wells (2000) Longman Pronunciation Dictionary. Harlow, Essex: Pearson, p. 478. ^ a b c d e f g "Baja Web Mexicali". Retrieved 2008-11-02. ^ a b c d e "Enciclopedia de los Municipios Baja California Mexicali" (in Spanish). Archived from the original on 2012-04-14. Retrieved 2008-11-03. ^ "Mexicali History". Trust for Mexicali Tourism. Retrieved March 10, 2011. ^ United States Geological Survey (April 4, 2010). "Magnitude 6.9 – Baja California, Mexico". Archived from the original on April 6, 2010. Retrieved April 4, 2010. ^ a b "Economy". Retrieved March 10, 2011. ^ "The Mexican Water Treaty:". Crc.nv.gov. Archived from the original on 2009-12-17. Retrieved 2011-06-22. ^ Archibold, Randal C. (July 7, 2006). "Border Fight Focuses on Water, Not Immigration". The New York Times. Retrieved 2008-06-19. ^ "Global Volcanism Program | Cerro Prieto | Summary". Volcano.si.edu. Retrieved 2011-06-22. ^ "Mercury in freshwater fish and clams from the Cerro Prieto geothermal field of Baja California, Mexico". EBSCO Host Connection. August 1988. Retrieved 26 Mar 2014. ^ "Average Weather for Mexicali, BC – Temperature and Precipitation". Weather.com. Retrieved 2011-06-22. ^ "Estado de Baja California-Estacion: Mexicali (DGE)". Normales Climatologicas 1951–2010 (in Spanish). Servicio Meteorológico Nacional. Archived from the original on 2 April 2015. Retrieved 6 March 2015. ^ "Silicon Border". Silicon Border. 2004-07-14. Archived from the original on 2011-07-16. Retrieved 2011-06-22. ^ "Incentives". Silicon Border Development. 2012. Archived from the original on 2014-03-07. Retrieved 2014-02-06. ^ "sili097.jpg – Click to see more photos". ImageShack. ^ Cummings, Joe. "Mexicali's Chinatown: Sharks fin Tacos and Barbecued Chow Mein". Archived from the original on 2009-02-07. Retrieved 2008-10-25. ^ "Mexicali". Catálogo de Localidades. Secretariat of Social Development (SEDESOL). Retrieved 23 April 2014. ^ "Página oficial de la INEGI". Inegi.org.mx. Archived from the original on 2011-07-22. Retrieved 2011-06-22. ^ "Sistema de Información Cultural – Conaculta – Mexico". Sic.conaculta.gob.mx. Archived from the original on 2006-02-10. Retrieved 2011-06-22. ^ "IMSS MEXICALI, A LA SERIE MUNDIAL DE WIILIAMSPORT". Archived from the original on 30 March 2012. Retrieved 15 August 2011. ^ "Salton Trough : Image of the Day". earthobservatory.nasa.gov. 21 June 2013.